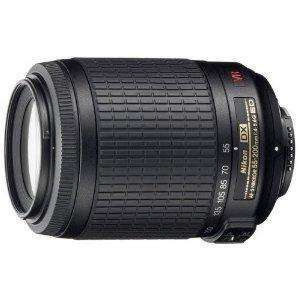 Nikon 55-200mm VR Lens @ buycamera.co.uk £149.99 / £114.99 after cashback! @ Buyacamera - with two years warranty and freebie! I posted this lens before, but that was with Amazon but unfortunately, the third party dealers don't give the cashback so it's more expensive there. Here it is, at cheaper than Amazon third party sellers by over £10 (after cashback) and cheaper than Amazon itself by £20! This link is for the 55-200mm VR lens, not the non-VR version. nikon.webfulfilment.com/cas…asp has this dealer listed. NOTE: This also has two years warranty instead of the standard 1 year, and comes with a free memory card reader (see front page for details). Oh poop you're right. I never noticed that before. Luckily it's, as you say, it's still cheaper and comes with an extra years warranty! good price, trying to decide between this, the 55-300 and the 70-300, apparently the 55-300 is slow. so leaves either spending £115 on this or like £350 on the 70-300mm anyone got any opinions on that extra 100mm? Thanks AV1985, I've been looking out for a good price for this lens, it has many rave reviews. Even with the postage added on this is a great deal. For me, the extra reach is important - every zoom I've ever owned from film days has always been maxed out for wildlife, etc. So I'm trying to decide on the 55-300 or 70-300. I considered the 300 too but reviews online put this lens at the top of the pile. Worth reading reviews to decide. And if the extra is worth it for the 300! All electronic goods sold in the EU come with a 2 year warranty. The European Directive 1999/44/EC says all EU countries have to ensure a retailer could be held liable for all "non-conformities" which manifest within two years from delivery. AV1985 is only technically correct but not correct when you come to reality of testing that theory. Almost everything sold in the UK to a consumer has the benefit of the SOGA. Under S.14 of that Act the goods must be of satisfactory quality. There is no set definition of what that it is but the court can take into account the cost of the item and therefore in theory more expensive things actually have a better warranty. Now the SOGA actually inserts conditions into the sales contract. S.14 inserting the condition of it being of satisfactory quality. As with any contract, you can sue for a breach up to 6 years after the breach occured. With a breach of a sales contract the courts will place the burden of proof on the seller for the first year. In other words if the breach occurs within year one it is the task of the seller to prove that the goods were of satisfactory quality on day 1. This is not easy given the thing has broken within a year but also will be difficult to prove technically. For this reason and for good PR almost all companies offer a one year warranty which covers this period. Now in years 2-6 the burden of proof shifts to the buyer. In theory then if something breaks 4 years after you buy it you can take the Seller to court. You will however be left with the unenviable task of proving beyond reasonble doubt to the court that on day 1 the goods were not of satisfactory quality. Producing that evidence 4 years later when you have been using it in the meantime is nigh on impossible and therefore whilst technically you can argue you get a six year warranty with everything, in reality you are quite wrong. Quick clarification, I didn't say that there is a 6 month warranty, that was Goliath! For this, since the seller offers 2 years warranty straight off, it saves a lot of hassle and is worth having when it's cheaper as well! good price, trying to decide between this, the 55-300 and the 70-300, … good price, trying to decide between this, the 55-300 and the 70-300, apparently the 55-300 is slow. so leaves either spending £115 on this or like £350 on the 70-300mm anyone got any opinions on that extra 100mm? Bought the 55-200 for my D90, and while it was a good lens I really wanted the extra reach- so i sold it and got the 70-300 (VR). I would highly recommend getting the 70-300, is fairly fast and its image quality is smashing. These go used on eBay all day long for £100! Purchased for my new Nikon. Have some heat! Bought the 55-200 for my D90, and while it was a good lens I really … Bought the 55-200 for my D90, and while it was a good lens I really wanted the extra reach- so i sold it and got the 70-300 (VR). I would highly recommend getting the 70-300, is fairly fast and its image quality is smashing. Agreed. The 70-300 is a semi-pro lens. The autofocus is much, much faster than the 55-300 (4 seconds faster iirc). It costs more, weighs more, but is well worth it imo. How does the saying go; upgrade your body, but invest in glass? Something like that. I wanted the extra reach of a 300, so I've gone for a Sigma AF 70-300 for Nikon. It doesn't have VR but for £103.99 it's a very good lens for the money. For something that goes out to 300, I would really want VR unless always using support of some kind, it is difficult enough to get clear shots with my sigma 70-210 handheld, so I think that 300 would be pushing it. If it helps, I have the 55-300 VR and it's really good. Extra reach at both ends which is what I wanted. VR and auto focus are excellent. Only neg would be that you can attach a tele convertor but I am not over fussed about that. It's not even that lenient. Within the first 6 months the onus is on the seller to prove it wasn't inherently faulty. After that, it's down to you to prove it was. Why has this been expired?? And how can you be sure a third party seller will give you UK stock with a European warranty? I've confirmed with a few sellers there that they will give a Worldwide warranty, not Europe BV, thus not available for cashback. My mate got the 200, he always wished he'd went for the 300. Just saying. And how can you be sure a third party seller will give you UK stock with … And how can you be sure a third party seller will give you UK stock with a European warranty? I've confirmed with a few sellers there that they will give a Worldwide warranty, not Europe BV, thus not available for cashback. All nikon lenses sold in the UK come with a worldwide warranty. 'Europe BV' is the distributor. Amazon would not knowingly sell any grey imports. Therefore buying a lens from a third party seller is perfectly fine and eligible for cash back! All nikon lenses sold in the UK come with a worldwide warranty. 'Europe … All nikon lenses sold in the UK come with a worldwide warranty. 'Europe BV' is the distributor. Amazon would not knowingly sell any grey imports. Therefore buying a lens from a third party seller is perfectly fine and eligible for cash back! I know I was lucky to get the 35mm lens from Hi-Tech, and it said NIKON BV as the distributor, and I got my cashback. But people have said they are getting Worldwide stamped on their warranty slips, which indicated the distributor is probably not from Europe, which is where the cashback promotion is being marketed. I ordered one from Hi-Fidelity and it didn't show Nikon BV as the distributor so no cashback, and I had to return it. Other 3rd party traders on there (someone called Britain something, as well as others) have confirmed to me that their products won't be eligible for cashback. So rather than risking an Amazon 3rd party seller, why not guarantee the cashback by buying from buyacamera, and get the extra year warranty too!? Hi, am interested in the deal but is there any reason this wouldn't be the better deal? Does anyone know whether Nikon would still honour the cash back if sold via "pink deals"? Hi, am interested in the deal but is there any reason this wouldn't be … Hi, am interested in the deal but is there any reason this wouldn't be the better deal?Does anyone know whether Nikon would still honour the cash back if sold via "pink deals"? As stated several times in this thread and in others, no, most likely Nikon would not honour the cashback if bought by third party traders. Confirmed by Nikon, the sellers themselves and I actually bought one from a third party seller and had to return it due to lack of cashback eligibility. Cheers AV1985, sorry for my ignorance. I had scanned the post but not appreciated the third party sellers tended to provide a Worldwide warranty whether or not they were based in the UK. Thanks for the heads up, I'll probably go for your posted deal.